Some of you Node veterans have probably heard of a few of these packages before, but I'm hoping from this article you'll find some really useful ones that you'd never heard of, like I did. I tend to forget there are so many packages out there, so I did some exploring and played around with a few. These are a few of my favorites. The yargs package is simple and straight-forward, and it'll save you from having to write boiler-plate code in all of your projects. It handles command line arguments for you, so the user can set flags and input any kind of data, including booleans, floating point numbers, and strings. yargs will even handle your 'usage' output, so you can easily tell the user which options your program takes, including which ones are required. yargs is nice enough to tell us what exactly we're missing in a nicely formatted message, and all we had to do was use the simple .usage() and .demand() methods. Just about every package could use this. This was one of those packages that, admittedly, I wasn't too impressed with at first, but quickly realized how useful it could be. It works by polling the Node event loop and tracks the 'lag', which is the time it takes for requests to be fulfilled. If the lag becomes too long, then toobusy will let you know, enabling you to return an HTTP 503 "Service Unavailable" code to the client. This is important because the busier your server gets, the longer wait times become. This quickly becomes a compounding problem that will only get worse as time goes on. If you do nothing, the service will shut down (aka crash) for everyone. But if you stop the processing early to return HTTP 503 then at least some requests will get serviced. Better some than none, right? It really doesn't take that much code, and even less configuration, so you could easily package this up in to a nice middleware and include it in all of your Express projects. Just make sure you're not cutting off any critical requests that have high priority or requests that contain critical data. Like toobusy, I didn't really realize the usefulness of chalk until I really took some time to think about it and where I've seen it used. User interfaces on the command line are very hard to create since all you have to interact with the user is a window for displaying text and a single text input. So how do you get the important information to stand out? One of the best ways is to add formatting to your text. Express is a good example of this. From their output you can easily find the most important information right away, so you'll never miss something critical. While these are the only colors officially supported, any xterm-compliant terminal can use the full 8-bit color codes. Good debuggers can be hard to find, especially ones with easy-to-use GUIs, which is why I'm a big fan of node-inspector. 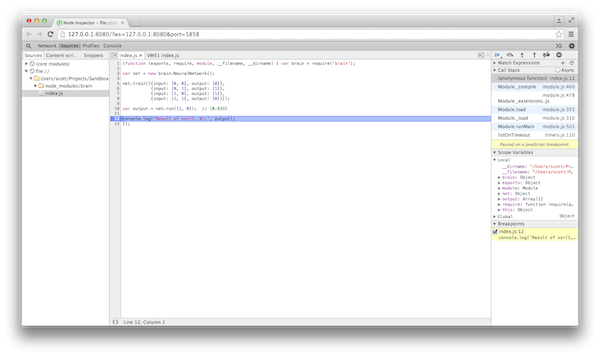 This debugger works by showing you a web page GUI to debug your code. It has all the features of a standard debugger, like breakpoints, stepping in and out of code, and variable inspection. It also has some not-so-common features that are really useful, like CPU and heap profiling, network client request inspection, and the ability to live edit running code. This last feature is one of my favorites as it'll save you a lot of time. For a long time I relied pretty heavily on using the console to output my debug information, which ended up taking a lot of time to add, edit, and remove my debug statements. Using the GUI has literally saved me hours of debugging time. Now, debuggers are nothing new, but some are much harder to use than others, and this is a good one to go with. The validator package helps out with a bunch of common string validations (like email addresses, credit cards, IP addresses, etc). A package like this is essential for whenever you get input from a user. You can almost think of your user as the biggest threat to your product. They'll make mistakes and input some really weird things in to text boxes, so you need a proven package to validate the input for you and avoid data corruption or server crashes. The normalizeEmail() method is an interesting one. It will ensure an email address is lowercase, and it even removes ignored characters from the username of GMail addresses. So, if you had the email [email protected], normalizeEmail() will normalize it to [email protected] since GMail ignores dots (.) and tags. One of the more difficult tasks I've tackled in the past was handling file uploads, which is why formidable made the list. formidable handles every part of the upload, including the multi-part parser, writing files to disk, and error handling. Even though many webapps don't allow the user to upload huge images and videos, many do allow profile pictures, which means you have to handle receiving the image, validate it, and write it to disk, which may not be an easy task depending on your constraints. This is one of those packages that I'm a big fan of because I really don't want to re-invent the wheel. It does one job, and it does it really well. shelljs is a package that lets you use common Unix commands on any system, whether it's Windows, Linux, or Mac. This way you don't need to write both bash and batch scripts for your projects. shelljs gives you the Unix-like environment to work with, so if you write scripts to run tests, commit changes, or launch on a server, you only have to write it once. Hopefully from this article you found some useful tools that you've never heard of, or maybe realized how useful some of these packages can be. A quick search or just browsing some open source projects can result in some good findings, so keep your eyes open. There are 190,000+ (as of 10/1/15) packages on npmjs.com, so whatever you're looking for is probably there. What is your favorite 'unknown' package? Let us know in the comments!